Earlier this week, actress Kelly Marie Tran, who played the new character Rose Tico in The Last Jedi, completely erased everything on her only social media account following excessive harassment and hatred from Star Wars trolls who did not enjoy The Last Jedi and took their anger out on Tran herself. Discovering this news, Luke Skywalker actor Mark Hamill has taken to social media to defend his co-star. On all three of his social media accounts, Hamill posted a simple photo of himself posing with Kelly Marie Tran, with the caption, "What's not to love? #GetALifeNerds." In the entire world, there is likely no one who is a bigger Star Wars fan than Mark Hamill himself. 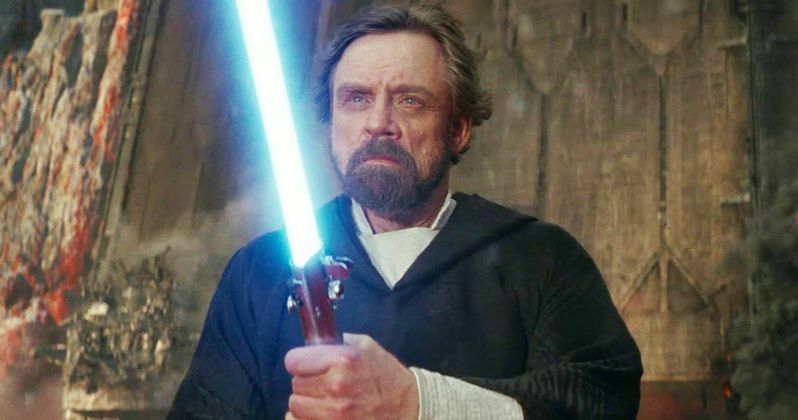 Despite what a few quotes said by him taken out of context may say, Hamill actually loved Star Wars: The Last Jedi and everything that the new movies have been doing. Because of this, it's not too unexpected to see Hamill stepping up in defense of his co-star and the movie itself, telling everyone who hated on her to get a life. The comments on his social media posts have had a rather mixed response. While some people defended Tran with him, absolutely sickened by the hateful and racial comments made about her, there were some who were less forgiving. A number of the people in Hamill's comments tried to justify the harassment, saying that she should not have been part of the "terrible" movie if she didn't want to receive harassment for it. Clearly, these people did not receive Hamill's message to "get a life." Mark Hamill is not the first person to stand up in defense of Kelly Marie Tran. Shortly following the news about Tran deleting her account, The Last Jedi's director Rian Johnson tweeted his reaction, absolutely disgusted with the bashing of the actress. Here's what he had to say. "On social media a few unhealthy people can cast a big shadow on the wall, but over the past 4 years I've met lots of real fellow SW fans. We like & dislike stuff but we do it with humor, love & respect. We're the VAST majority, we're having fun & doing just fine... Done with this disingenuous bulls***. You know the difference between not liking a movie and hatefully harassing a woman so bad she has to get off social media. And you know which of those two we're talking about here." Johnson has received around as much hatred on social media as Kelly Marie Tran since the release of The Last Jedi. While none of Johnson's harassment was race or gender based, it was still hateful, with a number of Internet trolls making a bigger deal out of a movie than they needed to. Clearly, Tran is not the only person sick of this online insanity, with both Hamill and Johnson needing to take a stand against it. While this statement by Mark Hamill was short, it still sent a message that Kelly Marie Tran is a human being with human feelings, and a great human being at that. At the end of the day, Star Wars: The Last Jedi is just a movie, and Kelly Marie Tran is just an actress who did her job well. You can hate Rose Tico all you want, but blaming the issues with the movie on an actress who didn't even do a bad job is just nonsensical, and clearly, Mark Hamill will not be having any of it.